Eurocom Corporation (www.eurocom.com), an Ottawa based developer of long lifespan, fully upgradable notebooks and high performance mobile workstations is working to help local clients in the National Capital Region acquire a second laptop for their cottage or summer vacations or a new system to replace their aging computer through the Eurocom Summer Sale. The summer sale ends June 30, to ensure availability visit Eurocom.com today. In addition to the Summer Sale Eurocom also offers a Factory Outlet with pre owned Eurocom and other brand notebooks from trade ins. Eurocom has also developed an Education Program to improve schooling for students and teaching for educators as well as a Trade In program to improve customers migration to cutting edge technology while offering discounts based on their trade in systems. Eurocom has been developing the highest performing Mobile Workstations, Notebook Gaming Systems and Mobile Servers in the World right here in Ottawa since 1989. Eurocom has been running their research and development, production, service and administration functions in the Colonnade business park in South Ottawa. “We would like to help the local community experience the true pleasure of computing with Eurocom long life span fully upgradeable notebooks. This is the first time ever that Eurocom has run a summer sale. Getting a quality system for a loved one, cottage, guest room, kitchen or living room has never been easier” explains President, Mark Bialic. “I've had my Eurocom for 5 years now and I have not had any issues or problems with it at all. I use my laptop for 8 hours at a time, IN MY LAP. (You can't beat working from a recliner.) It keeps up with all of my computing needs and handles multiple tasks well. I think this is a great thing to be able to say 5 years after a purchase. I spent $1000 at that time but it is well worth the money. Thank you, Eurocom.” Donna, Happy Eurocom customer. Eurocom is helping facilitate the acquisition of advanced Notebooks by offering a Summer Sale through their factory outlet. The Eurocom Summer Sale represents a great way to acquire the quality and long life span of Eurocom technology at a greatly reduced rate. Eurocom is offering systems targeted to consumers and business professionals in the National Capital Region. With summer upon the City of Ottawa there are many reasons to look at a new system, alternative or complimentary system to an existing business or personal platform. • If you lose or damage the system while on vacation you will not lose any of your important files or applications. • Provide a notebook to friends and family while visiting to prevent queuing for computer access. • Using the proper system can transform your living room into the ultimate entertainment center. • Provide a home work or study notebook for children. “Having an extra system at home is great. I have a laptop in my living room that I use to search online for interesting things I see on TV or to get a few things done with the game on in the background” explains Retail Sales Specialist John Shore. The systems in the Eurocom Summer Sale incorporate a wide range of performance and price points that fit every budget. 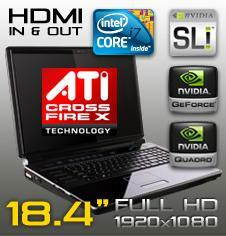 Prices range from $600-$1999 and displays ranging from net book size 12” to monstrous 19” multimedia notebooks. Eurocom Corporation has created a fully comprehensive program that ensures students and educators of all computing needs and disciplines have access to the hardware they require. Eurocom has always been at the cutting edge of computing technology, offering the highest performance options available on the market to ensure customers who require highly capable mobile platforms have access to them through Eurocom. This cutting edge technology is now more available than ever through the Eurocom Educational Program. Eurocom offers an Educational discount of 5% to High School Graduates, University Students and Educators and 10% to University Graduates and Post Graduate Students. For institutional purchases, it is recommended to contact the Eurocom Corporate Sales Manager to customize a purchase. The Eurocom Corporate Trade In program allows customers to maximize their IT budget and acquire fully upgradeable high performance computer solutions (EUROCOM notebooks, Mobile Workstation, Mobile Servers and all-in-one energy efficient PCs) in the most cost effective fashion. “The Corporate Trade in Program allows companies to upgrade their aging desktop centered hardware to newer, portable and efficient computer technology without a major impact on their IT budget” explains Eurocom Corporate Sales Manager Matthew Thompson. With the Eurocom Corporate Trade in Program, customers can save up to 20% off the purchase of new Eurocom technology when they trade in their aging non-EUROCOM equipment (notebook, desktop PC or server). Visit our dedicated web page to find the perfect model for you, call 613-224-6122 ext.238 to speak with a Eurocom Sales Representative or email a Eurocom Sales Representative at sales@eurocom.com .